The title of this article is from the first line of the national anthem of the country of Ukraine. 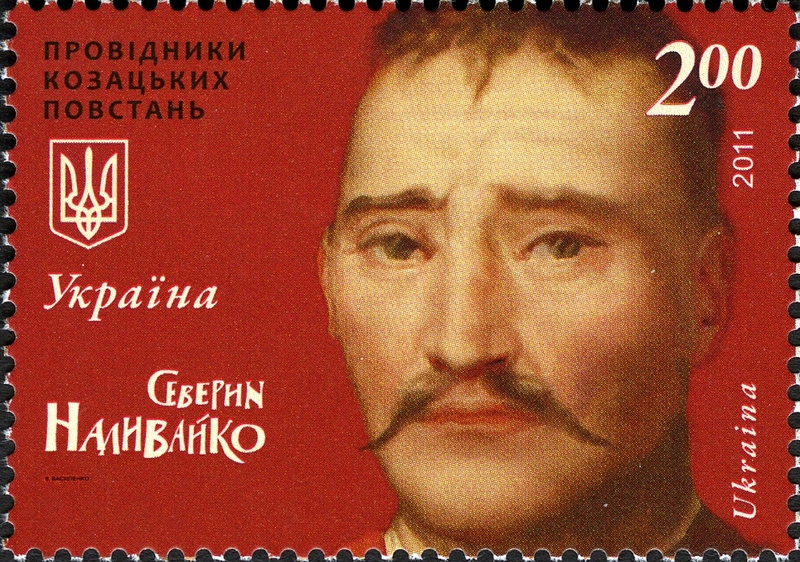 (Transliterated from the Ukrainian; written Ukrainian uses a variant of the Cyrillic script). These words speak to me of a country and a people who have suffered at the hands of powerful neighbors and despotic rulers. But why am I pursuing this line of inquiry? Through a DNA-matching service I connected with a distant relative who has intimate knowledge of the country—she has lived there all her long life. I offer here, with permission, her narrative about her country. To begin with, the word Ukraine means Borderland. It’s been a borderland between the Forest and the Steppe for millennia, and then a borderland between the Catholic and Orthodox Europe for centuries. This probably explains a somewhat schizophrenic nature of the nation’s history and mentality. Ukrainians have seldom been sure about who they actually are—sort of European or a sort of Russian, or something else. The country is quite large, around 600 thousand square kilometers [note: slightly smaller than Texas]—and populous, around 46 million (plus a few million trying to make a living for their families by working abroad). Ukraine is primarily known for its fertile land (arable land is roughly half of the country’s territory, around 30 mn hectares—ca. 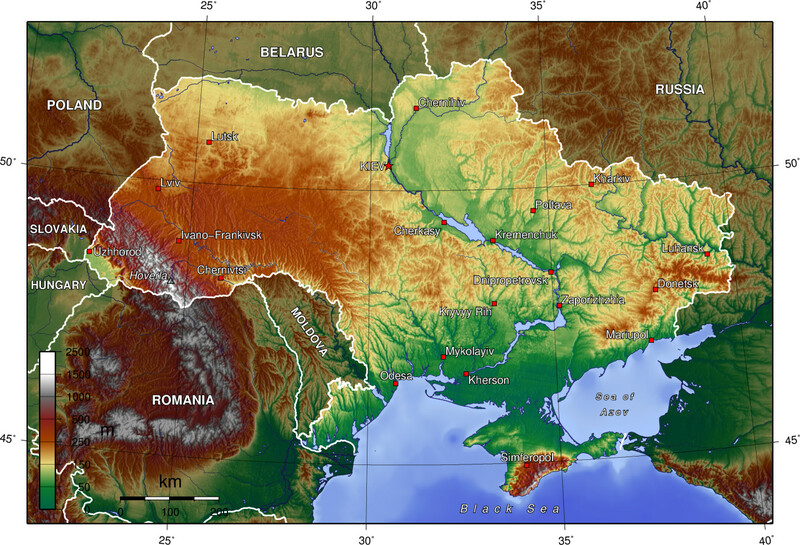 75 million acres), and I was taught that Ukraine accounts for a third of Earth’s most fertile soil, chernozem. Ukraine is also a major steel exporter. It is less lucky in terms of energy, as its once big oil, gas and coal resources are somewhat depleted, and the country is strongly dependent on Russia for oil and gas supplies. During the Soviet era, Ukraine was a major machine engineering centre, but a substantial part of this industry (especially defence-oriented) has been destroyed since the collapse of the Soviet Union. Still, Ukraine currently exports a lot of various heavy machines. The territory of what is now Ukraine was the centre of two major kingdoms, first the Gothic state of Ermanaric in 4th century and, much later in 9th-13th centuries, the medieval polity of Kievan Rus‘. Both had capitals on the Dnieper river, near the border of forest and steppe. It’s not clear where Ermanaric’s capital was, but Kiev (my native city), the capital of Rus, exists until today. Rus collapsed following Tatar invasion in 1240, and the semblance of order was restored only when the principality of Lithuania drove the Tatars from more or less densely populated parts of Ukraine in the middle of 14th century. 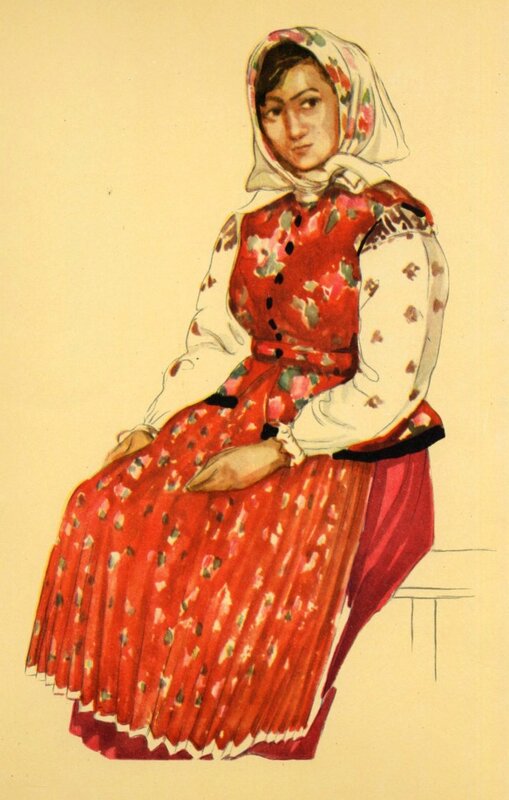 Lithuanian rule was a period of stability as less numerous Lithuanians lived in relative harmony with much more populous Rusyns—descendands of Slavic tribes that comprised Rus and ancestors of modern Ukrainians and Belorussians. Later on, Orthodox Christian Lithuania started to become more and more integrated with Catholic Poland through a dynastic union. In 1596, the southern part of Lithuania’s Slavic lands was administratively subordinated to Poland, and the northern part remained under Lithuania. This was the beginning of Ukraine in the southern Dnieper river basin, and Belarus on its northern border. Dealing with Catholic Poland turned out to be difficult, and the next few centuries included numerous episodes of civil (or, rather, religious) war between Poles and Ukrainians. 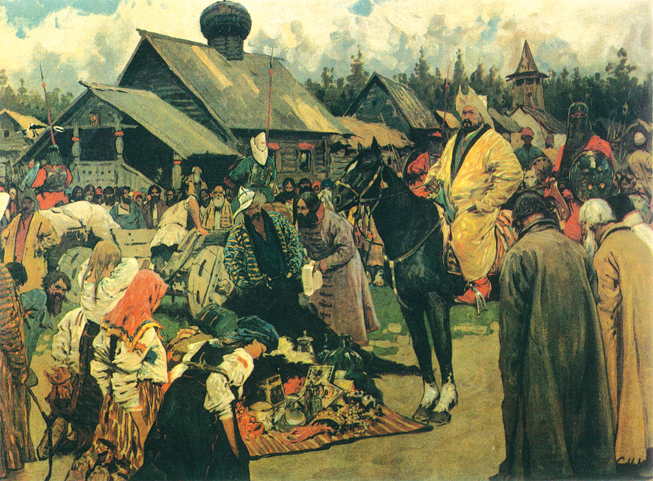 Eventually, Ukrainians had to seek protection of the Moscow principality which later became Russian empire. However, Western parts of Ukraine continued to be ruled by Poland, the Austrian Empire and then again Poland until World War II. The country as it exists today was in fact created by Joseph Stalin. When the lands that comprised the former Russian empire were transformed into Soviet Union, he put together less loyal Ukrainian-speaking agrarian regions located along the Dnieper river and more loyal Russian-speaking regions to the East to make sure the new republic will not steer away from Russia. Then, during the Second World War, he added the Western Ukrainian regions most of which were parts of Austria-Hungary and then Poland for a long time. The guy has been dead for almost 60 years, but his dark wisdom continues to work. After more than 20 years of independence, Ukraine still remains strongly dependent on Russia, and not so much economically as mentally. Roughly 40% of modern Ukrainian population are “pure” Ukrainian speakers, another 40% or so are bilingual, and the remaining 20% are pure Russian speakers and minorities. The borders of old days may not be visible on the modern map, but if you look at maps showing how Ukrainians vote in elections, they immediately become so clear as if medieval kingdoms were still here. One part (often hated elsewhere in Ukraine) is the Halychyna, a Western land lying along the banks of Dniester River. 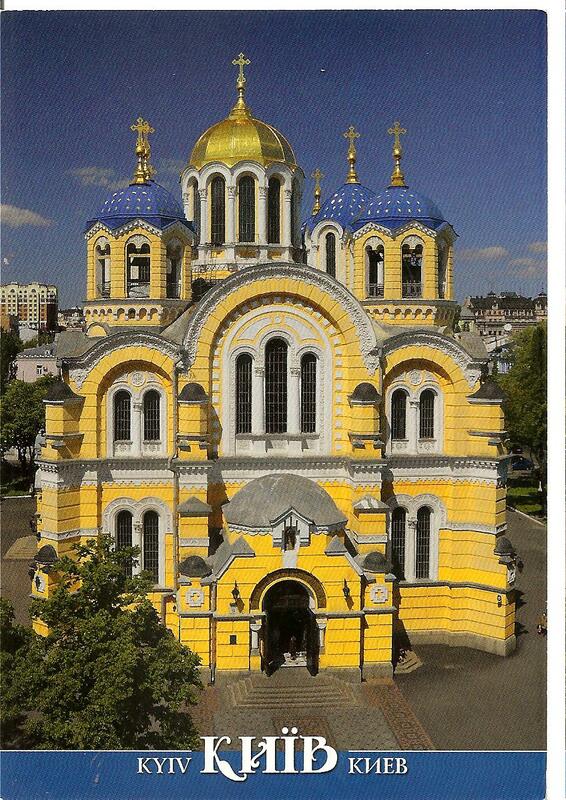 Another one is Ukraine proper—a core of the country lying in the Dnieper river basin. Finally, the country’s Eastern and Southern parts, which became more or less densely inhabited only after the Crimean Tatar state was destroyed by the Russian Empire in late 18th century, are a kind of “Ukraine’s New World”, populated by the natives of all corners of the former Russian empire. Actually, the self-identification based on ethnicity is not an ancient thing—it’s a child of 18th and 19th century. Before that time, people usually self-identified based on their religion or allegiance to a certain dynasty. And Ukraine is not the only state where borders do not fully coincide with ethnic distinctions—just look at Central Asia or Africa or Iraq or even Belgium. As for the borders, I think in the future they will cease to be defined ethnically as during the last 2-3 centuries. People come and go, but natural features persist. If you look at a good map of river basins (some maps can be found here), you will notice that many ancient and/or modern borders are based on watersheds of major rivers. This could be a good basis to define borders in the present and future as trying to define them on ethnic basis will always leave one of the sides unhappy. As for Ukraine, I would say that its Eastern part lying in the basin of Don river is mostly Russian and can go to Russia without pain. Things will be more difficult in the south as almost totally Russian-speaking Crimean region is too dependent on Ukraine (and also has a Muslim Crimean Tatar minority). But in any case I don’t think Ukraine or Belarus can survive without Russia in the long run (and Russia will struggle to remain secure without a union with Ukraine and Belarus as well), so the question of borders in this case is more rhetorical. In any case, the topic of future borders is very interesting. I strongly doubt that the inviolability of borders principle that became established in the international public law as recently as 40 years ago will be followed in the next 40 years as well. It will be more and more becoming a mere fig leaf to hide geographical and/or ethnic realities. Joseph Stalin made life difficult for modern Ukraine, but the results of his border-making policy in Central Asia will detonate in the next 10-20 years in a much more massive way (when the post-Soviet generation of local leaders goes, the region can become a real hell). So I think the topic of future borders and factors that will determine them is definitely worth studying. Politicians in Ukraine belong to two types—smart thieves and outrageous thieves. Timoshenko [Yulia Tymoshenko, former prime minister] is from the second category, and I have no pity for her. I don’t like her opponents either, but these half-criminal representatives of Eastern Ukrainian elite are probably the country’s last chance to remain independent for longer. But the problem is not in Ukraine or West vs. Russia in Ukraine. The bigger problem is that the whole international financial and political system is flawed and it is waiting to collapse. This is Ron Pavellas writing again. All the above, except the introduction, was from my relative. I sent her an article on the current political situation in Ukraine, excerpted below asking her opinion of it. I show not only my relative’s response to it, but also those of the readers of the article who responded to it. Last month, as these leaders sat in prison and Ukrainian authorities announced plans to bring new charges against them, negotiators initialed the E.U.-Ukraine Association Agreement. The pact includes a deep and comprehensive free-trade agreement. 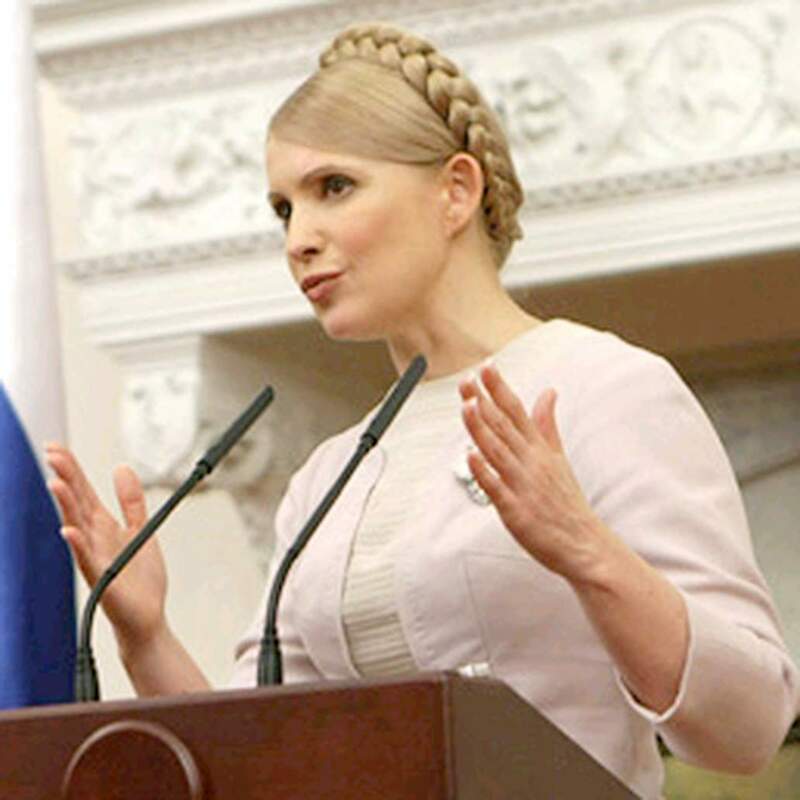 Yet the European Union is unlikely to sign and ratify the agreement as long as Tymoshenko, Ukraine’s most prominent opposition leader, remains in prison or before parliamentary elections this fall, a critical test of this government’s willingness to conduct a free, fair vote. The Ukrainian government is pursuing contradictory policies: It seeks to integrate Ukraine into Europe while emasculating its domestic opposition. In their first two years in office, Ukrainian authorities have made progress on both fronts. Ultimately, though, they must choose. Ukraine’s choice is not between Russia and the West. That is a false choice. 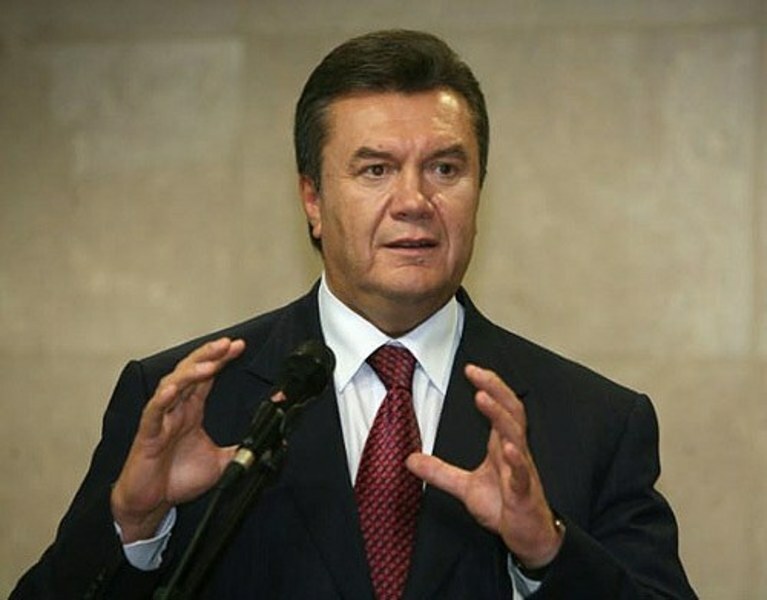 Indeed, (Ukraine President Viktor) Yanukovych has courageously challenged President-elect Vladimir Putin’s plan to assert control over the states of the former Soviet Union through a Eurasian Union. The question is whether Ukraine sees its future in the European mainstream or relegated to the borderlands. It is not too late to take the democratic path. The government has made some progress in the past year, including enacting legislation that allows nongovernmental organizations to be active on civil-political issues without being considered political actors and to accept foreign funds in a transparent manner; advancing a more modern criminal procedure code; and increasing public access to government information. But it must do more. The government’s first step should be facilitating independent medical care for Tymoshenko and Lutsenko. Ukraine can avoid international ostracism, and perhaps even U.S. and E.U. sanctions, by respecting the independence of the judiciary and allowing all opposition figures, including those in prison, to contest parliamentary elections in October. Ukraine teeters between Eurasian malaise and an ambivalent Europe. As long as the government in Kiev criminalizes political differences, it will find itself in control at home but increasingly isolated internationally. U.S. and European policy should make clear that a democratic Ukraine that makes the right choices is welcome as a member of the transatlantic community. (My relative’s comments): As for the article—I must admit that the author seems to be trying to be balanced. This happens less often than one would expect of the “free world” media covering Ukraine. Unfortunately, his sources seem to be some local Western-leaning media people, so the facts are not always correct and sometimes are irrelevant. Nobody in Freedom House would care if former premier Timoshenko won the presidency and put Yanukovich to prison, because she is believed to be pro-Western. This is pure hypocricy. If we speak about the real big villains, then why the voices about the political system of China are not heard as often as they should have been? Because trade interests dominate the desire to bring the light of democracy to all nations of the world? Maybe the guy honestly believes it’s all about democracy, but I find it difficult to come up with explanation other than that in the case of Ukraine it’s all about geopolitical interests of the US and broader Western world vs. the geopolitical interests of Russia. Damon M. Wilson, an independent observer, writes of the brutal treatment of opposition political figures. His clear condemnation of the thuggish leaders of Ukraine should be heeded. Heeded, perhaps, but Wilson leaves out more than he discusses. 1) Just because the jailed politicians are opposition does not mean they don’t belong in jail. 2) The issues preventing EU accession for Ukraine are a lot bigger than political corruption. Better to be in jail than poisoned. The problem here is a wonderful country that has lived under a corrupt political system and uncontrolled capitalism. A people oppressed so long can only struggle to survive. At some point they become too passive-aggressive to accomplish anything except the basics of life. Survival of the fittest. I stand by my assertion that the future of Ukraine is in the hands of the people, not in the corrupt and decadent leadership. Certainly not in the pimps that prop up the circus tent. The UEFA cup, coming up in June, has the country investing Billions of UAH into infrastructure and they have done a credible job despite the cronyism and kickbacks. Most of the events are being handled by local volunteer groups who work for free.. This is their time to shine and show pride in their country and show the rest of the world that despite the clown in charge (little more than a puppet) the country is a proud and free nation with much to offer. If only the criminal element could be disposed of. Ukrainian elite is corrupt. Everyone could get in jail. Timoshenko was sued by Ukrainian laws, her behavior in the court was outrageous. In states she would have gotten much bigger jail time only for such a behavior. She, in reality, crossed many lines and put Ukraine in a very difficult situation. She is a populist with a very little knowledge of economy and law. I believe, that it is the western diplomats who select for whom they should struggle. It means that they aggravate ordinary Ukrainians who feel that Yushchenko – Timoshenko administrations robbed them. I think, that before saying something westerns should get familiar with the case and video of Timoshenko from the court room. Many oppose Yanukovich style but even less want Timoshenko back. So, I see that my inference, expressed at the beginning of this article, was correct: Ukraine is country and a people who have suffered at the hands of powerful neighbors and ruling despots. This entry was posted in Demography, Geography, Government & Politics, History and tagged Bohdan Khmelnytsky, Kiev, Nalyvaiko, Ukraine, Viktor Yanukovych, Yulia Tymoshenko, Yuri Lutsenko, Zalizniak. Bookmark the permalink. Thanks, Tim. There is so much to learn about any country, especially one whose borders have periodically changed and which, like Afghanistan, is between two or more strategic/powerful places. Agreed – lets keep on it! It’s interesting to see the difference between old countries and a new one like the US. It looks like eventually those of us from European decent will become the minority. Nothing to fight over. Just the way it is.